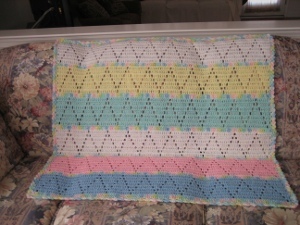 The eyelet parfait afghan is a cute baby afghan from Roseanna Beck that is light and airy. 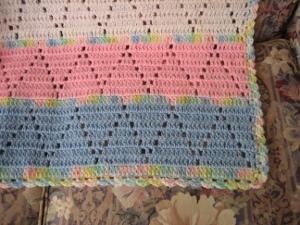 These free crochet afghan patterns are very easy to crochet, in gorgeous pastel colors. Row 2 – Join blue with a sl st in first dc, ch 2, 1 dc, *ch 1, skip 1 dc, 1 dc in each of next 11 dc, rep from * across ending ch 1, skip 1 dc, 1 dc in last 2 dc, ch 3 and turn. Row 3 – Dc in dc and ch 1 sp, *ch 1, skip 1 dc, 1 dc in each of next 9 dc, ch 1, skip 1 dc, dc in ch 1 sp, rep from * across ending ch 1, skip 1 dc, 1 dc in ch 1 sp and last 2 dc, ch 3 and turn. Row 4 – 1 dc in each of next 2 dc and ch 1 sp, *ch 1, skip 1 dc, 1 dc in each of next 7 dc, ch 1, skip 1 dc, 1 dc in ch 1 sp, dc, and ch 1 sp, rep from * across ending ch 1, skip 1 dc, 1 dc in ch 1 sp and last 3 dc, ch 3 and turn. Row 5 – 1 dc in each of next 3 dc and ch 1 sp, *ch 1, skip 1 dc, 1 dc in each of next 5 dc, ch 1, skip 1 dc, 1 dc in ch 1 sp, 3 dc and ch 1 sp, rep from * across ending ch 1, skip 1 dc, 1 dc in ch 1 sp and last 4 dc, ch 3 and turn. Row 6 – 1 dc in each of next 4 dc and ch 1 sp, *ch 1, skip 1 dc, 1 dc in each of next 3 dc, ch 1, skip 1 dc, 1 dc in ch 1 sp, 5 dc and ch 1 sp, rep from * across ending ch 1, skip 1 dc, 1 dc in ch 1 sp and last 5 dc, ch 3 and turn. Row 7 – 1 dc in each of next 5 dc and ch 1 sp, *ch 1, skip 1 dc, dc in next dc, ch 1, skip 1 dc, 1 dc in ch 1 sp, 7 dc and ch 1 sp, rep from * across ending ch 1, skip 1 dc, 1 dc in ch 1 sp and last 6 dc, ch 3 and turn. Row 8 – 1 dc in each of next 6 dc and ch 1 sp, *ch 1, skip 1 dc, 1 dc in ch 1 sp, 9 dc and ch 1 sp, rep from * across ending ch 1, skip 1 dc, 1 dc in ch 1 sp and last 7 dc, fasten off and turn. Row 9 – Join hushabye with a sl st in first dc, ch 2, 1 dc in each dc and ch 1 sp across, fasten off and turn. Row 49 – Join hushabye, Rep Row 9, fasten off and do not turn. Rnd 1 – With I hook and hushabye work along top edge sc in right corner dc, *ch 2, skip 2 dc, sc in next dc, rep from * across ending sc in last dc. Work along side edge *ch 2, sc in dc, rep from * across ending sc in first corner ch of bottom edge. Work along bottom edge *ch 2, skip 2 ch, sc in next ch, rep from * across ending sc in last ch. Work along side edge *ch 2, sc in dc, rep from * across, join to beg sc. Rnd 2 – Sl st into ch 2 sp, (ch 2, dc) in same sp, (sl st, ch 2, dc) in each ch 2 sp around entire afghan, join to beg sl st and fasten off. okay, but how do you ch 1 sp?...do you chain 1 and then skip one? Beautiful. I plan to make this one!